Memory is a funny thing. The older I get, the more unpredictable it becomes. On the one hand, I have a hard time remembering what I ate yesterday for lunch or what was the plot of the book I just finished reading two nights ago. On the other hand, random memories will be pop up, seemingly for the first time, out of nowhere. The float to consciousness like bubbles from the dark, deep corners of my mind. Often, these memories are triggered by a smell or a taste. I am well aware that our sense of smell is tightly linked to our memory function, but still, every time it happens, I marvel at the ability of a group of molecules that reach my nose or tongue to evoke such strong emotional recollections. The first time I made this orange blossom ice cream, I had exactly this kind of experience. I had just finished cooking the custard base and I added the three tablespoons of orange blossom water that the recipe called for. Since the custard was steaming hot, the smell wafted up to my nose. The memory it triggered was of all the times that my mom made us a simple custard, flavored with orange blossom water (called anthonero), to have as dessert. I hadn’t thought of that custard in decades. And yet, as soon as I remembered it, as soon as I smelled it in the bowl and tasted it on the spoon, I had a clear recollection of how it tasted of spring, how its creamy consistency coated our mouths, and how my sister and I always ignored my mom’s warnings to wait until it cooled down to eat it. I knew that this recipe would be amazing, even before I chilled the custard in the fridge and froze it in the ice cream maker. 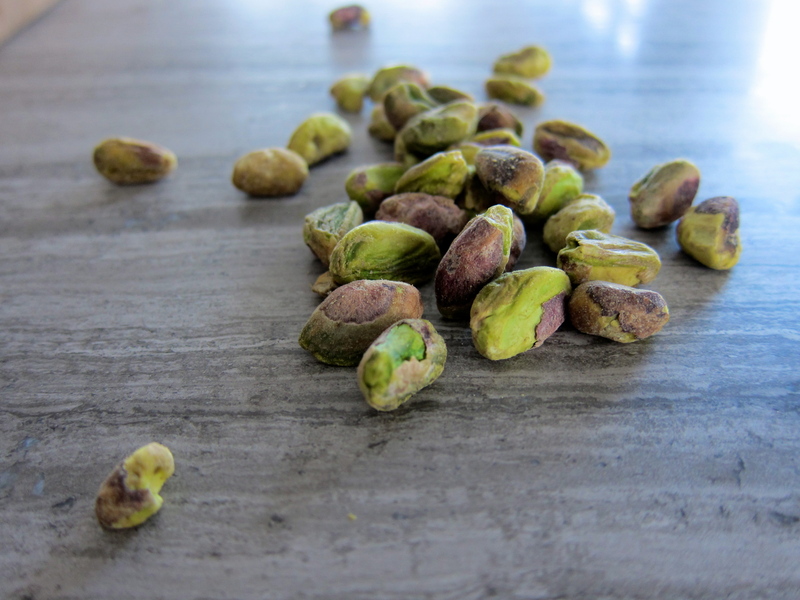 I’ve made it many times since then and at some point I decided to add chopped pistachios for a taste and texture contrast, which turned out to be a fantastic idea. This is a very easy ice cream to make. It uses cornstarch to thicken cream and milk into a quick custard. The trick is to make sure there are no cornstarch lumps and to cook it just enough time that it thickens and you can’t taste the “floury” cornstarch anymore. And if you are like me, the toughest part is to try not to eat it hot out of the pan, instead of chilling it and turning it into ice cream. In a small bowl or a 2-cup measuring cup, stir together the cornstarch and heavy cream using a fork, making sure there are no lumps. 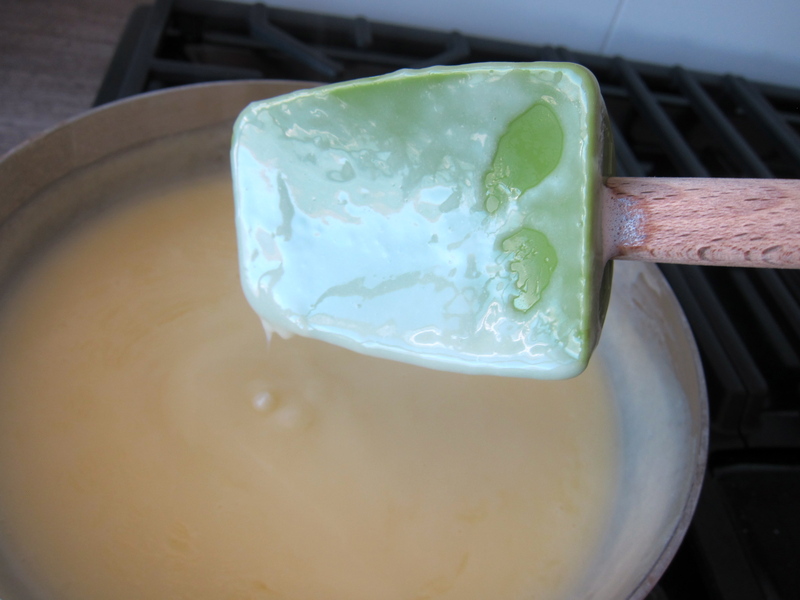 Place the milk and sugar in a saucepan and bring to a simmer, stirring so that the sugar dissolves. 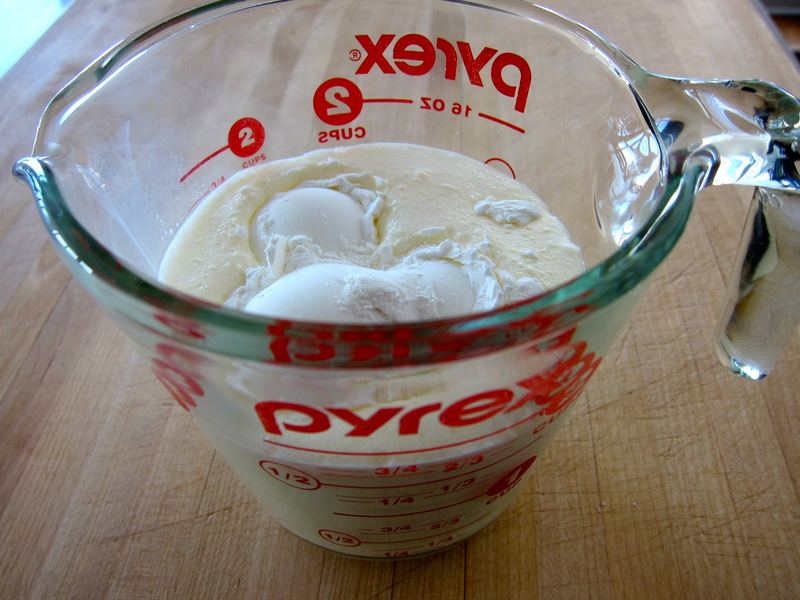 Remove from the heat and stir in the heavy cream mixture. Return the pan to the stove and cook over moderate heat, stirring constantly, until it thickens. It should coat the back of the spatula or spoon. Taste the mixture: make sure it does not have any floury taste, if it does, continue to simmer it until the cornstarch is cooked. 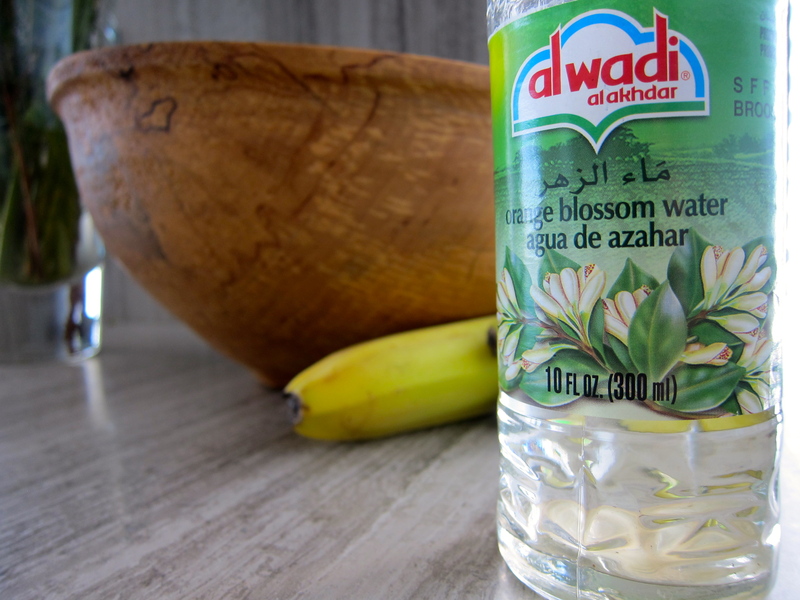 Remove from the heat and add the orange blossom water. Chill the mixture thoroughly in the refrigerator, then churn in your ice cream maker according to your manufacturer’s directions. 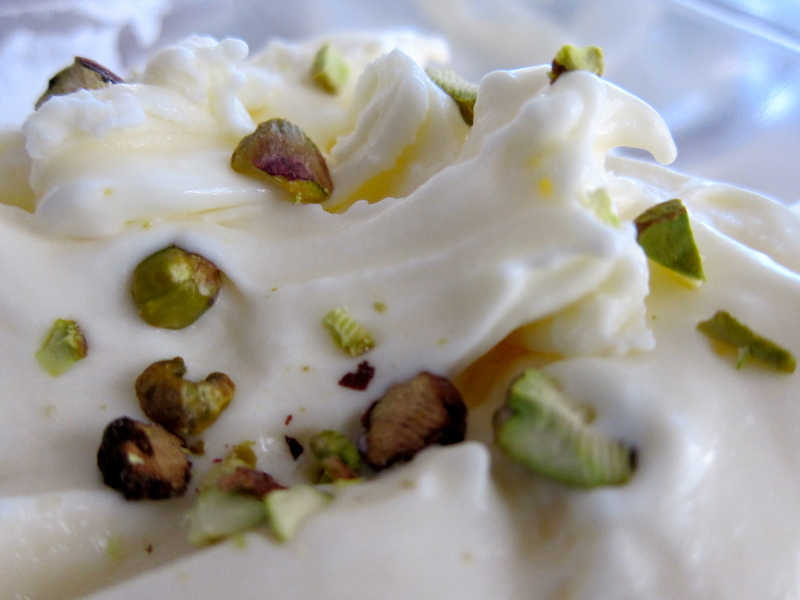 Add the chopped pistachios towards the end of the churning or layer them into the ice cream as you spoon it into its container from the ice cream maker.